Satin bed sheets give your bedroom an air of romance. 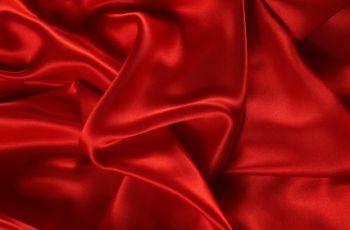 Satin is a man-made fabric. This woven material can be made from one or a combination of three fabrics: polyester, nylon acetate, and silk. It may surprise you to learn that silk might be found within the fabric content of satin, but the first satin material was made out of silk and is still known today as satin silk. Satin has many of the same properties that you'll find in the more expensive, natural silk fabric. Satin sheets are silky smooth and provide tactile pleasure that leaves you with the impression of great luxury. You can be sure of the soft cool feel beneath your hand. It's easy to distinguish the front and back of a satin sheet since the backside of the fabric is dull in comparison. Bridal Satin: This kind of sheet is made either from acetate or polyester fabric. Bridal satin fabric is the closest fabric to being like charmeuse silk (satin silk). Both fabrics are very smooth to the touch and have high to low sheen surfaces. The average bridal satin has a 300 thread count. Charmeuse Satin: This woven polyester is finely woven to be similar to the kind of satin used for lingerie. The weight of the fabric isn't as light as that of lingerie, but is much lighter than bridal satin. If you've never slept on satin, perhaps you've worn it. You may recall how luxurious and rich the colors were or how sensual the satin felt against your skin. The same kind of experience is conveyed to satin sheets. Once you've slept on satin sheet, you may be like so many other people and never purchase any other kind of bedding. For decades, women have often slept on satin or silk pillows, both renowned for keeping a hairdo undisturbed due to the slipping properties satin offers whenever turning or moving. Why not expand the satin experience to your entire bed? Silk is another excellent luxury choice in bedding but many customers complain that it is too slippery, especially when wearing silk or satin pajamas or nightgowns. Satin is not as slippery as silk, which makes it a better choice for those people. Many comedy skits have been made about silk sheets where the occupant is unable to stay in the bed and continuously slides across the mattress onto the floor. Satin sheets are the perfect next step down for an elegant tactile fabric. Not all satin is created equal, so you'll want to check the labels or description on websites to determine how your new sheets will be cleaned. Are these sheets easy to wash and dry or is special cleaning required? Most modern satin sheets can be washed and dried at home, but certain fabric combinations may have specific washing instructions, so you need to read the care labels. Satin fabric can sometimes have shrinkage. The shrinkage factor is something you should try to discover prior to purchase. Many websites give a percentage for the amount of shrinkage you might expect. Don't get upset if your new sheets seem to be a bit oversized. To compensate for future shrinkage, many manufacturers make the sheets a little bigger than normal or for fitted sheets allow for a deeper pocket to fit your mattress. Flat sheets usually have a wider hem of around four inches. After a few washings, you'll quickly be glad the manufacturer allowed for the shrinkage. You probably have noticed the color saturation for satin is deeper and richer than other fabrics. These properties also allow for a sheen on the fabric surface similar to silk. Satin bed sheets will cost more than some other fabric sheets but like other bedding, the higher the thread count, the higher the price will be.